The 2014 symposium is being hosted by the Department of Physics and Astronomy at Swarthmore College, in Swarthmore, Pennsylvania. The symposium will begin with a reception on Friday evening, November 7 at 6:15 PM, followed by a dinner at 7:30. Both will be held in Upper Tarble (see map below). Weather permitting, the observatory will be open after dinner. The symposium will continue on Saturday at 9:00 AM, with student talks in Science Center 101 (see "Entrance to Physics/Astro Dept." on the map below). A light breakfast will be provided starting at 8:15 AM outside of the meeting room. Lunch will also be provided. The meeting will adjourn at 3:30 PM. Talks are 10 minutes (plus 2 for questions). Multi-author talks are 15 minutes. New: The program of talks runs from 9:00 AM to 3:30 PM on Saturday. 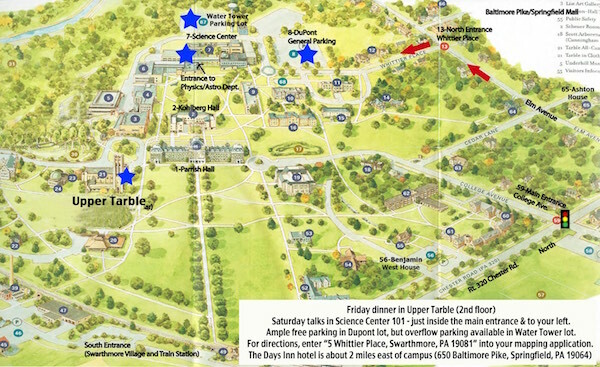 Symposium attendees will stay at the Days Inn, 650 Baltimore Pike, Springfield PA 19064, which is about 2 miles from campus. For purposes of mapping, we recommend you enter "5 Whittier Place, Swarthmore PA 19081" to get to directions to the Science Center. This campus map should come in handy. It shows the Science Center (talk venue), nearby parking, and Upper Tarble (Friday night dinner venue). © copyright 2014 David Cohen and the Keck Northeast Astronomy Consortium.